We supply a range of balloons in latex and foil and can fill these with helium while you wait. If you require a large quantity of balloons inflating please contact us first to discuss your requirements. Our staff will offer advice and give you a quotation over the phone aswell as advising on availability and a suitable collection time. 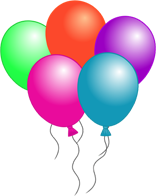 The price of helium varies depending on the size and shape of the balloons being inflated. We are happy to inflate you own balloons aswell, just give us a call for a quote. Below are some of the examples of Balloon Bunches that we can offer!